Goku's got more than a few moves in his arsenal of attacks. He's got the Kamehameha Wave, Kaio-ken, Spirit Bomb and even Instant Transmission, but there's one thing that really takes a fight to the next level: going Super Saiyan. Super Saiyan isn't just some crazy way for him to go blonde for a little while; it also makes him glow with a warm fuzzy glow and makes any punch, kick or Ki attack seem like getting hit by a semi-truck. 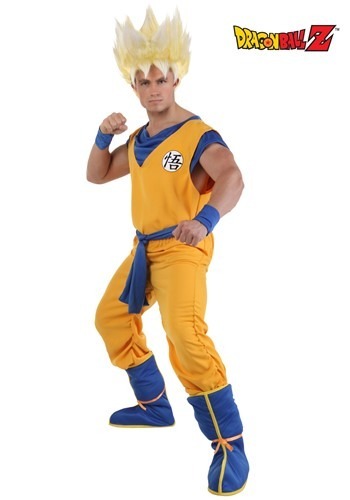 This Dragon Ball Z costume, based on Goku's transformation makes you look like a transformed warrior, complete with his training gear in a light orange color, made to look like the yellow aura of a Super Saiyan. Very happy with this costume. It is very well made and seems very durable. Partnered up with some one else who was wearing the Vegeta costume and the amount of attention this got walking the NYC streets was amazing. Highly recommend it for a Halloween night. Buy it with the super saiyan wig.